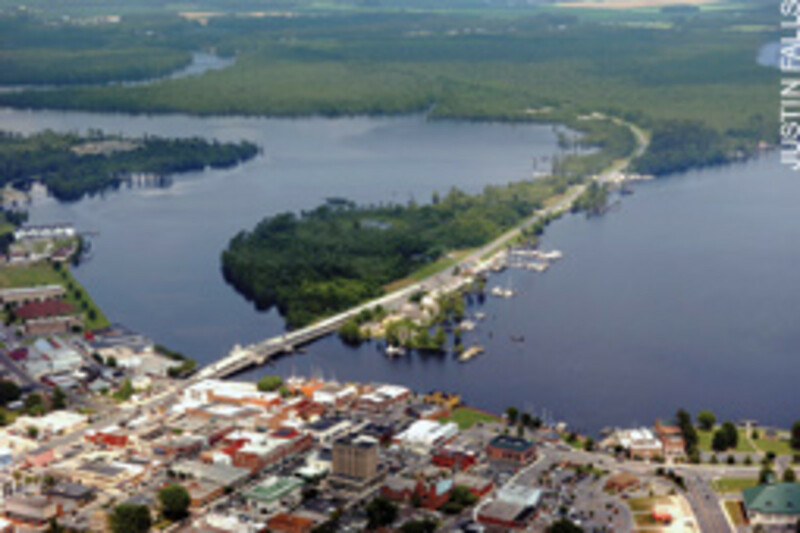 Elizabeth City is on a sharp bend of North Carolina&apos;s Pasquotank River, just below the U.S. 158 bascule bridge. 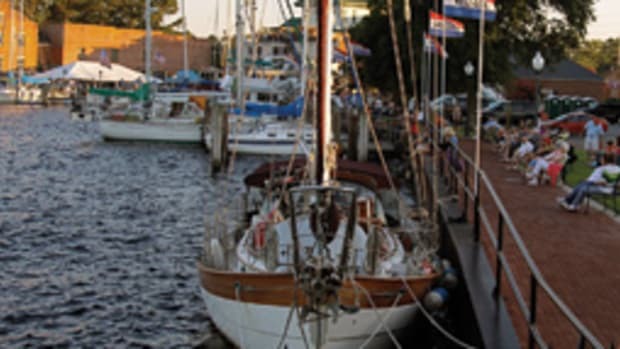 It&apos;s the major port on the Dismal Swamp Canal route and about 20 miles from the Atlantic Intracoastal Waterway in Albemarle Sound. In the Pasquotank River "red, right, returning" refers to the river channel, so red markers are east of the channel, green to the west. 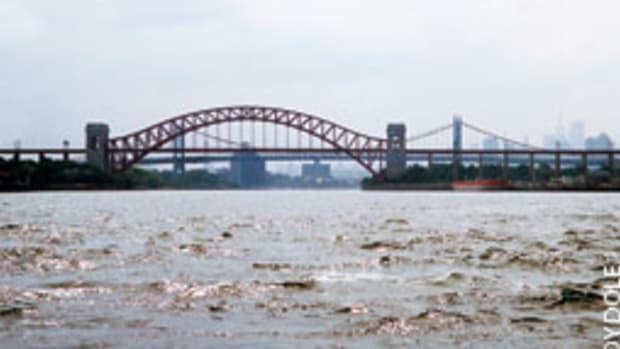 A huge World War II-era blimp hangar stands on the western shore downriver of the city. At Mariners&apos; Wharf, which is swept by strong crosscurrents, the tidal range is 6 feet. 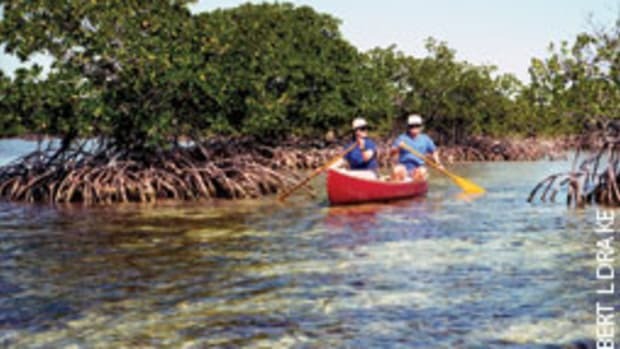 Boats often raft along the seawalls or at nearby private docks. 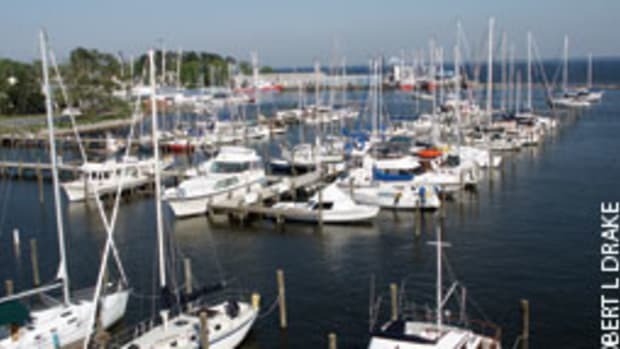 Boaters can anchor in the Pasquotank and dinghy in to Mariners&apos; Wharf and the free dinghy dock. Hull, engine and prop repairs and service, sail repairs and canvas work are available locally. Just upriver of Elizabeth City, the U.S. 158 bridge (closed clearance 2 feet) opens on demand - (252) 331-4772, VHF channel 13 - except during weekday rush hours. Morning rush-hour openings are at 7:30 and 8:30, and afternoon openings are at 4:30 and 5:30. Dismal Swamp Canal locks at South Mills, N.C., and Deep Creek, Va., normally open at 8:30 and 11 a.m., and 1:30 and 3:30 p.m. Each lockmaster also operates the adjacent bridge. Boaters entering the canal lock through before those leaving it. Although the canal is marked, maintained and reportedly dredged to 6 feet, boaters are warned to watch for deadheads, debris and shoals. 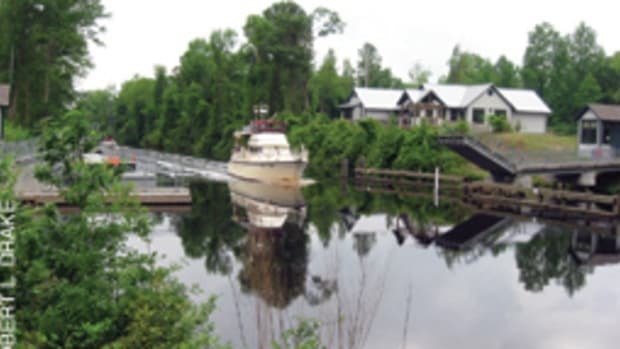 Penny Leary-Smith, who continually lobbies the government to keep the canal open and dredged for recreational boaters, and her staff at the Dismal Swamp Canal Welcome Center have the latest information. 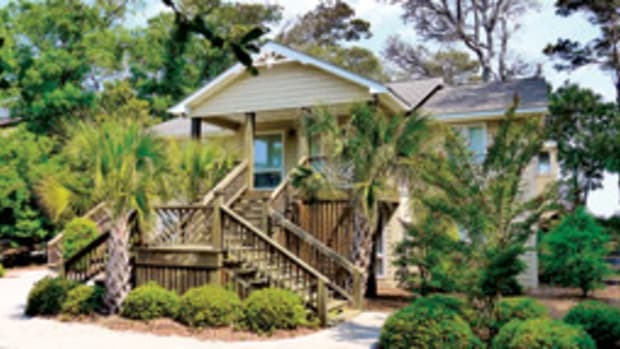 Adjacent is 150 feet of free dockage with 6-foot depths alongside (rafting allowed), water, restrooms and a picnic area. The new pedestrian swing pontoon bridge across the canal to Dismal Swamp State Park&apos;s facilities opens on demand for boats. NOAA chart 12206 SC, Norfolk to Albemarle Sound via North Landing River, or Great Dismal Swamp Canal, includes the canal, Pasquotank River, Elizabeth City and approaches. Mariners&apos; Wharf, downtown at Elizabeth City municipal dock, has free 48-hour slips for boats to 50-plus feet LOA along the seawall. Additional dockage can be arranged nearby. Water, restrooms and showers are nearby. Pelican Marina, (252) 335-5108, www.thepelicanmarina.com, is a half-mile downriver of the city (east bank) on Camden Causeway. Floating docks accommodate boats to 55 feet LOA for $35 a night, including water and power, showers, Wi-Fi and a boaters lounge. 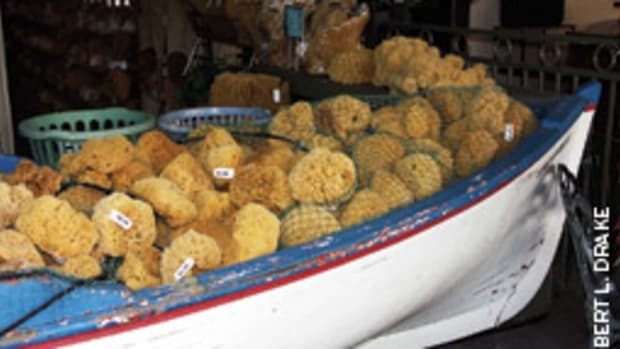 The marina offers pumpout, diesel, gas, a ship&apos;s store, fishing supplies, ice and laundry. A restaurant is adjacent. Elizabeth City Shipyard, (252) 335-0171, is a half-mile downriver of downtown on the west bank. When rebuilding is complete, it will have space for boats to 100 feet LOA in 6- to 10-foot depths at fixed and floating docks. Rates include showers, water and power. Full and do-it-yourself repairs, 60-ton lift and marine supplies are offered. Elizabeth City Area Convention and Visitors Bureau, (252) 335-5330, (866) 324-8948, www.discoverec.org. Army Corps of Engineers (canal, lock and bridge information), (757) 487-0831, (757) 441-3641. Dismal Swamp Canal Welcome Center, (252) 771-8333, www.dismalswamp.com. Dismal Swamp State Park, (252) 771-6593, www.ncparks.gov. - Destination Elizabeth City, N.C. If you decide to go - Vero Beach, Fla.